While I didn’t match the 35 countries I visited in 2015, last year was truly an adventure. Some highlights include learning how to train horses in Sweden, getting my passport for the UK, an amazing month exploring Scotland, adventures in Sweden, setting up and losing a home base in Edinburgh, my dad coming to Scotland, moving to Thailand and many more. My brother arrived in Thailand on December 18th, and we’ve been traveling around the country since then. After a couple days in Bangkok, we went north to explore Chiang Mai and Pai, which I’ll be posting about soon. Then we took an overnight bus back to Bangkok, and another bus in the morning to the ferry headed for Koh Chang. 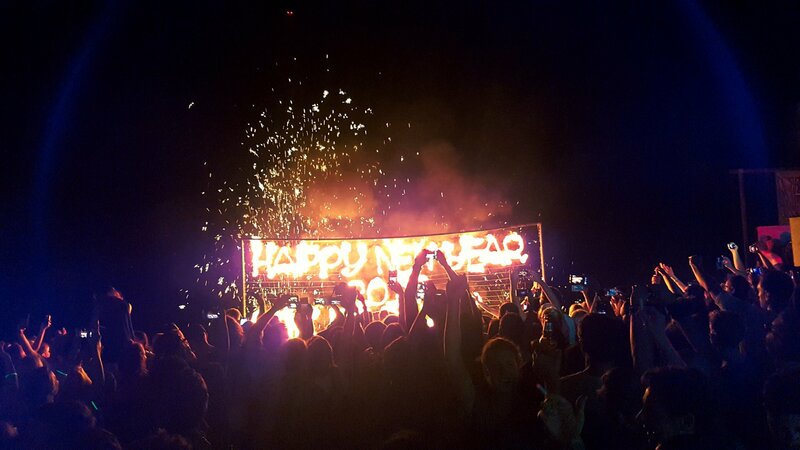 New Year’s Eve was spent at Lonely Beach on Koh Chang Island in Thailand. The island is located about four hours down the eastern coast of Thailand from Bangkok on the Gulf of Thailand near Cambodia. It’s regarded as the most beautiful (and least touristy) of the famous islands in Thailand. I couldn’t agree more. Meeting up with several other friends from our hostel, we all went to a series of bars on the beach, all trying to outdo the last. While they were categorically too loud, they weren’t nearly as busy as I was expecting. The first bar wasn’t much, but got the ball rolling with drinks for everyone. The second bar was something else. Everyone had a coupon to get a free bucket of vodka and a mixer. This was followed by a fire show. Now, I’ve seen half a dozen fire shows this year, all of which I enjoyed. This one put them all to shame in a big way. These Thais must practice daily for years, because they are truly amazing. The drunk crowd made it more difficult for them by walking into the flaming swords, but that just made their skill all the more impressive. The bar has certainly been raised for me as to what is a good fire show! From there, we made our way down to Lonely Beach proper. Two key bars were vying for attention on the sands, each with their own DJs pounding out the music. We secured our spots in front of the wicker framework with the words “Happy New Year 2017” ready to light on fire, and counted down to the New Year. Unfortunately there were no fireworks, which I believe was a nation-wide decision due to the recent death of the King. New Year’s Day dawned hot and beautiful on the island, with hardly a cloud in the sky. After a breakfast of a Thai omelet on rice and a coconut shake (my favorites), we all went down to the beach to spend the morning. I might have developed a bit of a sun burn (my second in two years of traveling) before a couple of us went to get a Thai massage on the beach. After giving so many massages all over the world for the past year, I’ve been getting as many as I can since I’ve been back in Thailand. After all, it’s hard to beat a massage for $5! I brought my new laptop (with a battery that works) to work at the beach and then grabbed a lunch on the Bang Bao Pier. After that it was back to the beach for more swimming before a truly gorgeous sunset. You know, I think I could spend a long time on this island. My brother agrees, and it looks like we might be cancelling our planned trip to Koh Tao (which is currently getting hit by typhoons) to stay a few more day on Koh Chang. My New Year’s resolution is to take the blog to a whole new level. My tagline in 2015 was the Skye is the Limit and I traveled to 35 countries, catching up for lost time. 2016 had the tagline of The Skye Covers the World, with the adventures mentioned above. In 2017, I plan to kick it into high gear with the motto Travel the World with Class. I’ll be revamping the blog with a new style, and also revamping me! It’s time for a better wardrobe, and a change of travel style. While I’ll still be helping budget travelers with tips and advice, I’ll also be looking into activities and adventures for the rest of the travel community. The first phase of my year plan includes making a bit of money. I’ve already secured a teaching job in Chiang Mai for the next couple months, during which I’ll continue to hop around SE Asia on my weekends off. Concurrent with that, I’ll be working on increasing my freelance writing jobs. One of which is an opportunity to work with Lonely Planet. There is a program set up were if I am featured three times in Lonely Planet, I move up to paid assignment level with them. In six months I’ve been featured twice. Hopefully my third feature will be at the outset in 2017. Wish me luck! Along with that, I plan to get into better shape. A new wardrobe will help, but I also plan to get a gym membership, and I will be practicing yoga on a daily basis. Of course, those frequent Thai massages will help too. If you don’t believe me, check out why you should get massages yourself. After my stint in SE Asia, the tentative plan is to return to Scotland for a short period to see my dad, and then set up a home base in Romania. I completely fell in love with that country in 2015 when I visited for a week. It’s dirt cheap, the food is delicious, the people are wonderful, travel prices are unbelievable (routine flights around Europe for $5 each) and it has the fastest internet in Europe (second in the world after Korea). Did you know that? From there, I will be visiting the remaining sixteen countries in Europe I have yet to get to. Maybe that’s all a bit ambitious for a New Year’s resolution, but aren’t they supposed to be. And isn’t that what a travel blog is all about? I’d love to hear back from you as to what you’d like to see in the blog this year, and what you enjoy reading the most. What are your New Year’s resolutions? Do they include travel? And most importantly, is there anything I can do to help make them a reality? Previous The Sheikh Zayed Grand Mosque in Abu Dhabi is So Much More Than Grand!